Giga Watt – A Month Later is Still a No Go! The WTT tokens are a bit better, but our disappointment extends there as well. There is still no price-varying real market for renting the tokens (you cannot use the tokens when your miners do not get deployed for months already). You still need to rent out all your tokens and you cannot rent them all even at the lowest price, so you are losing on that as well… no matter how much tokens you get you can rent maximum about 70% at the lowest price or less if you increase the price. Recently the company has risen the prices for electricity with 20% “in favor of the token holders”, but nothing really changes that much, at least your tokens should earn you a bit more. So we would also recommend not to go investing in WTT tokens now. Last year when Giga Watt (the former MegaBigPower) announced their WTT token sale we were pretty excited about it and not only participated, but spread the word about it. With the good track record we were expecting big things to happen, but now, 9 months later we are really disappointed from our experience with Giga Watt in general and would want to warn everyone to stay away from their services. It is all but a delay after delay after another delay and things not happening for months after they take your money and in the world of crypto delays with months are not something that anyone wants as things change quite rapidly. Let us see why we are not happy. First we were promised tokens that represent actual power capacity in the Giga Watt facility, of course they needed some time to build that capacity, so as a result there were more than a few month delays until the release of all of the tokens. Unfortunately letting users know how is development progressing during all this time has been less than well done with just a few scarce updates instead of constant updates on progress. We were promised market for these tokens that would allows us to profit from holding and leasing them to users needing power to host their miners and if there is a demand we could get higher price. Well, guess what, even at the lowest price of 4.2 cents you are not able to rent more than 60% to 75% of your tokens, regardless of how many they are and this has been like that from the start months ago. In the end you have some 30 or more percent of your tokens free all of the time, so why not purchase some of the miners sold by Giga Watt and have them hosted at their facility to actually utilize the free tokens for something. Great idea, right, or so we thought and wanted to try it out a couple of months ago, so around the end of November last year we have purchased the following ASIC miners: Antminer S9 13.5 TH/s – PSU Included Batch 6 January and Antminer L3+ – PSU Included Batch 6 December. With these descriptions one would expect that the L3+ would go online in December or January latest and the S9 in January or early February. Guess what, it is already mid March and our miners purchased and paid for are still not online in Giga Watt’s facility. We were pertinently waiting and waiting for something to happen, but our patience ran out completely at the beginning of February and the reply we got from Giga Watt was that our miners “should be deployed in February”. Well, they were not deployed in February and at the end of the month we were pretty pissed off already, so asking what is going on we got a reply that “Batch 6 hardware is expected to start the deployment process in March”. It is already mid March and we are still waiting for our miners to be deployed, even though earlier this month Giga Watt has released more tokens, meaning that they have additional power capacity already. There are two more weeks by the end of the month although we do not have high hopes that we are going to see our miners getting deployed in that time frame, but even if we do see them we are clearly already very disappointed and not only will not recommend Giga Watt’s services, but will warn people not to rely on them at all. We are really disappointed from Giga Watt not delivering on time and on their promises and disappointed customers do not get compensation or refunds, so just stay away from them and save the trouble. We do plan to sell the tokens we own and move on, apart maybe from the ones needed by our miners if we ever see them getting deployed this month, or maybe the next one or who knows when. There is less than a day left until the Cryptonomos platform completes the Giga Watt (WTT) token sale. 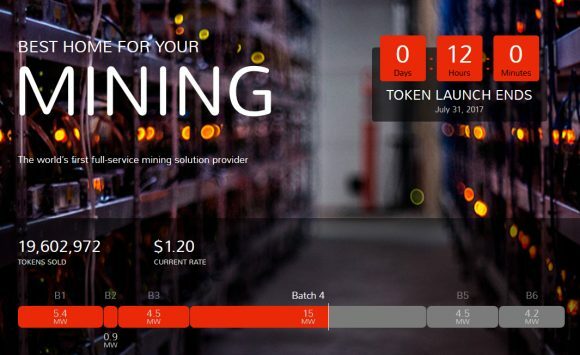 You have just a bit short of 12 hours left to take part if you find this token interesting and meaningful as it already has a successful underlying service for hosting crypto currency miners and is going to expand it further with the help of the tokens. The token sale is close to the 20 million mark, though it has not yet reached it and the original goal they were aiming at was 30 million. Buying tokens at the last moment comes at a bit higher price of $1.20 USD per token, but that happens if you wait for the last moment to act. Still you have some time to act and not miss the chance of supporting the expansion of Giga-Watt’s facilities and getting some WTT tokens that can be used to host your own miners or be rented to other users that want to get a better deal on miner hosting.